I have been a fan of this band for the past few years. It started when I heard the track “The Legend of John Henry,” but then I really got hooked when I heard “Pergutory,” “White Lightning,” and “The Brown Bomber.” The sound and energy coming out of this trio is amazing. Their style is raw, it’s gritty, it’s dirty, it’s high-powered and I. Love. It. 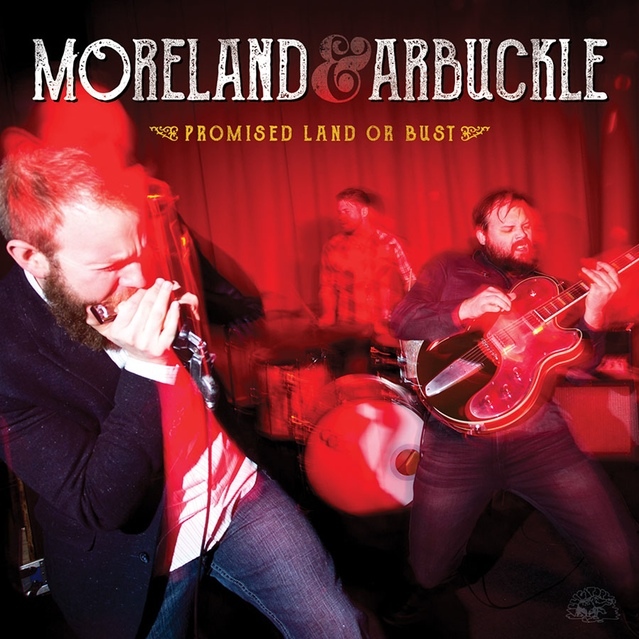 Moreland & Arbuckle is comprised of three guys from America’s heartland: Aaron Moreland (guitar); Dustin Arbuckle (harmonica, vocals, occasional bass); and Kendall Newby (drums). They have built a respectable fan base that began with filled-to-capacity venues around Witchita, KS, then extended to tours around the United States, Canada, Europe and beyond. And last fall one of the most respected independent blues labels, Alligator Records, signed them—which seems to have accelerated the marketing and publicity efforts of their latest album, Promised Land or Bust. I have seen them live at least three or four times and look forward to their next tour of the Mid-Atlantic. Besides their high-powered, electrified roots sound, what really drew me in was that Moreland plays a cigar box guitar (my husband builds them, which I featured here) and almost all songs are done without an additional bass player. Moreland typically carries the bass line with one string while he plays lead guitar, but occasionally I’ve seen Arbuckle show his versatility by playing a few songs on bass. All the while Newby keeps a solid attack on drums. Their style of music is categorized as roots rock/blues, but essentially they blend Delta blues, Mississippi Hill Country blues, rock, folk and country into electrified versions of something fresh. Essentially it’s a blend of roots rock turned up to eleven. The New York Post describes them as having “a raw juke joint exuberance with a dirt-under-the-fingernails garage band attack.” I couldn’t have said it better. Check them out, from earlier releases to the upcoming new disk. Promised Land or Bust is their sixth album and is expected to release May 6th. I cannot wait. From what I’ve read, it was produced by Matt Bayles (a highly regarded sound engineer, producer and musician based in Seattle) and will have a somewhat traditional sound compared to their last couple of releases, but will still maintain some of their self-described grit and power. And to read more about this talented trio, check out the Moreland and Arbuckle website. Their back story is interesting and you can get previous releases as well as their tour schedule. “The Legend of John Henry” show-closer, The Hamilton in Washington, DC on Aug. 19, 2014.